1.2.1 ¹One of the 2.4GHz antenna is used for ZigBee, if SmartThings hub is enabled. 1.2.2 ²Data rates can be adjusted to 600Mbps if the SmartThings Hub is enabled. 1.2.4 4Wi-Fi coverage will vary based on home construction and layout. If you're not familiar with Samsung's SmartThings Hub, it essentially acts as a bridge between all your smart home products (the supported ones, anyway) and whatever device you want to control them with. If you've been wanting a SmartThings Hub and a mesh Wi-Fi network, you can do both with the new Samsung Connect Home. Announced in March, the Connect Home's major selling point is that it's both a mesh Wi-Fi network system and a SmartThings hub. Just like the Google Wifi and similar products, the Connect Home comes in packs of one or three, which cost $169.99 and $379.99 respectively. For comparison, a single Google Wifi unit costs $129 and a three-pack costs $299. Samsung is also offering a 'Connect Home Pro' with more powerful hardware for $249 as a single unit (no three-pack is offered). If you want to buy one (or three) for yourself, you can pre-order them from Best Buy at the source links below. RIDGEFIELD PARK, N.J. – JUNE 1, 2017 – Samsung Electronics America, Inc. today announced Samsung Connect Home will be available exclusively for pre-order on BestBuy.com starting June 4. Samsung Connect Home is the industry’s first Smart Wi-Fi System to combine fast, reliable Wi-Fi coverage for every room in a home with Samsung’s industry-leading smart home platform, Samsung SmartThings. 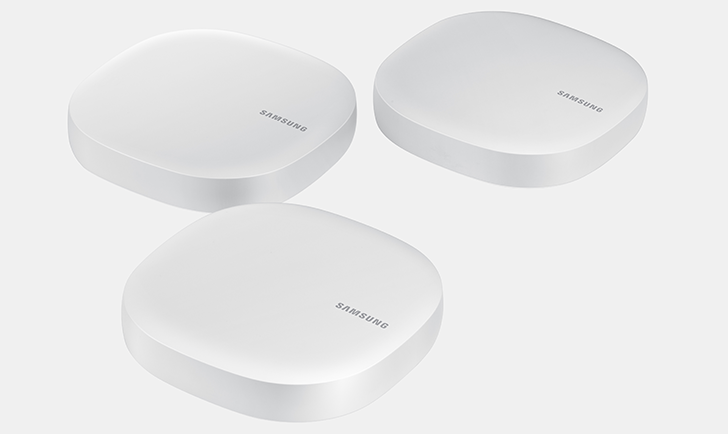 The Samsung Connect Home Smart Wi-Fi System is available as a three-pack or single. Ideal for homes up to 4,500 square feet, the three-pack has an MSRP of $379.99. A single Connect Home is for homes up to 1,500 square feet and has an MSRP of $169.99. For homes with high bandwidth demands for gaming, streaming or home offices, a single Samsung Connect Home Pro is available at an MSRP of $249.99. A consumer can connect up to five Samsung Connect Home devices at once. Works As A SmartThings Hub – Samsung Connect Home is the only whole-home Wi-Fi system that works as a SmartThings Hub, making it compatible with hundreds of Works With SmartThings devices. With no monthly fees or subscriptions, Samsung SmartThings makes it easy to automate and manage your smart home, and gives you the flexibility to expand your smart home with lights, door locks, cameras, voice assistants, thermostats and more. Expandable mesh Wi-Fi network – Samsung Connect Home is easily expandable. Each router has a range of 1,500 square feet, and users can wirelessly connect up to five Samsung Connect Home devices for mesh network coverage of 7,500 square feet. Safe & secure – Consumers can rest easy knowing that Samsung Connect Home is protected by hardware-based security technologies. Automatic firmware updates provide additional safeguards to keep smart devices secure. Simple setup and unified management – Samsung Connect Home can be set up with easy-to-follow instructions using the Samsung Connect app. The app will guide placement of each Samsung Connect Home device throughout a home for optimal performance. Samsung Connect simplifies smart device management with automatic connectivity, convenient device integration and easy set-up. Using Samsung Connect, users can easily see and manage connected devices, set parental controls and allow guest access. Compact design – Samsung Connect Home replaces larger, antenna-laden routers with a simple, sleek and compact design that can be placed anywhere and everywhere in the home, even in plain sight. Samsung Connect Home will be available for purchase on July 2 at Best Buy stores and BestBuy.com. For more information, please visit http://www.samsung.com/us/explore/connect-home/ . ¹One of the 2.4GHz antenna is used for ZigBee, if SmartThings hub is enabled. ²Data rates can be adjusted to 600Mbps if the SmartThings Hub is enabled. 4Wi-Fi coverage will vary based on home construction and layout.